As soon as I saw Taschen’s luscious volume Hiroshige: One Hundred Famous Views of Edo in a museum gift shop, I knew I had to have it. I don't have a big budget for luxury items these days, so I was delighted to find how affordable it was. Released in 2010 as one of Taschen’s 30th birthday “Golden Books,” reprints of luxury books at affordable prices, this volume packs a lot of bang for the buck. 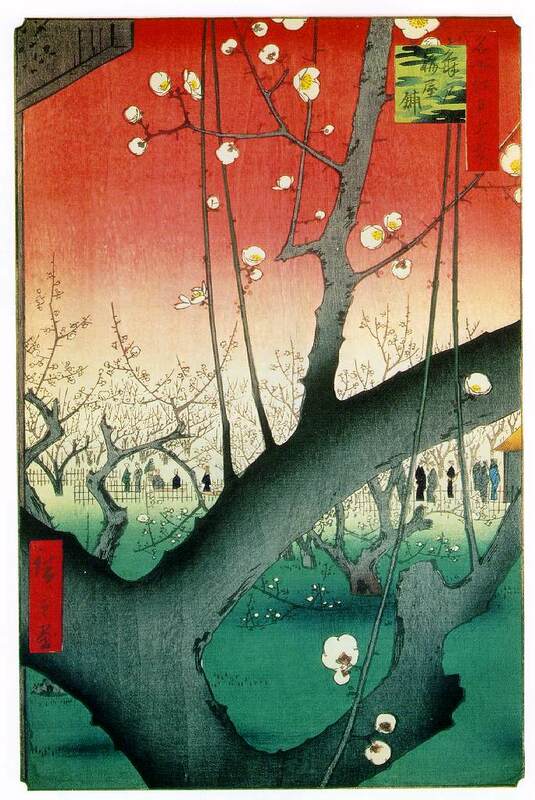 Encased in a box depicting a detail of Hiroshige's iconic grey tree limbs and white plum blossoms against an organish-pink sky and fastened with faux ivory toggles, this book is a must-have for art lovers. Inside the box, the book itself is soft bound Japanese style with a silk-like cover, and printed on folded paper allowing printing on only one side of each sheet. The 118 ukiyo-e prints were reproduced from a series of original wood-block prints in the Ota Memorial Museum of Art in Tokyo, one of the few complete series consisting entirely of impressions from the first run. Later editions, many of which found their way to Europe, were printed with fewer color blocks and did not display the delicate color gradations of the original prints. "After the publisher had commissioned the print, the ink drawing had, following a decree of 1790, to be submitted to the censors and given the round seal of approval. In the One Hundred Famous Views of Edo, this seal is placed, together with a date seal, either at the top of the print or on the left, outside the image. . . . Following the appearance of a print with 72 different colours the previous year, a censorship law of 1842 restricted the number of colours to eight. 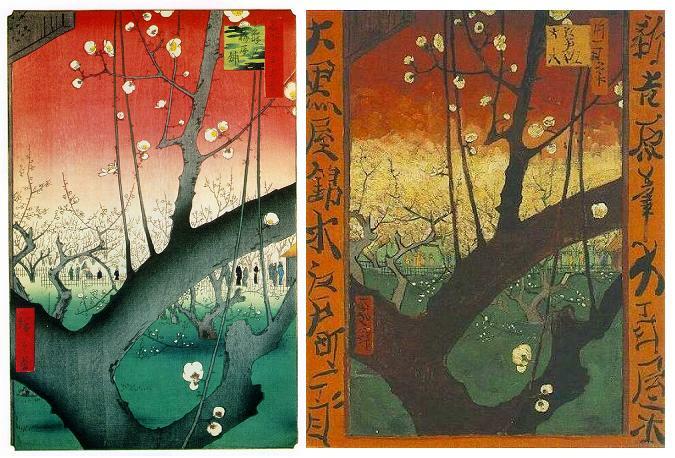 Hiroshige's series demonstrates that the colour limitation also had its positive sides." 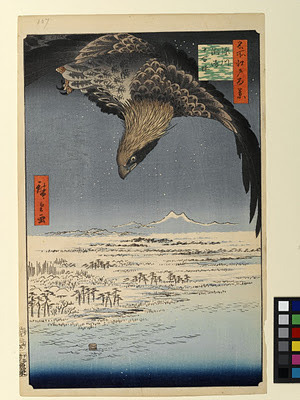 So sophisticated were the printing techniques used by Hiroshige, that some of the original images, such as the carp banners in Suido Bridge and the Surugadai Quarter, and the eagle plumage in Fukagawa Susaki and Jumantsubo were printed employing expensive mica dust that created a silvery shimmer. The eagle’s talons were printed with animal glue to produce a deep shine. 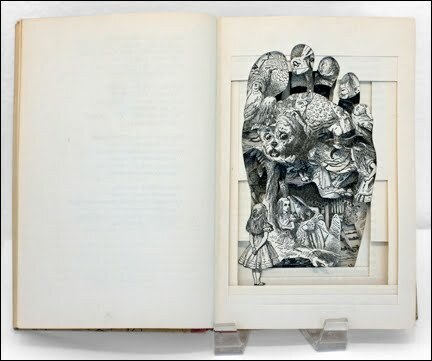 "It is to the printers that the series owes numerous visual effects, such as the subtle gradations, known as bokashi, which give volume to an area of colour, or express effects of perspective or light and make each print unique. 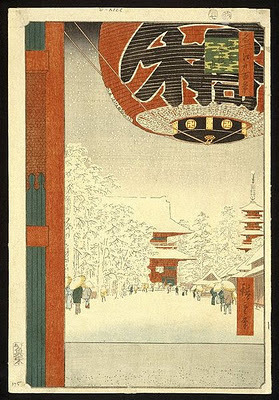 There are various forms of bokashi, for example atenashi bokashi ("not-indicated colour gradation"), frequently used in this series, in which the cloudlike colour gradation is applied to an area of the woodblock not indicted by the artist, for example in the sky or water surfaces." The prints, which depict over a hundred views of mid-19th century Edo (now Tokyo), were incredibly popular in their time and each was printed between ten and fifteen thousand times. Hiroshige chose to use a vertical format for the scenes, novel in its time for landscapes. The prints depict temples, shrines, public parks, famous trees, pure landscapes, rivers, canals and bridges, throughout the four seasons. Some reflect current affairs, such as the depiction of a reconstructed Edo, rising from the ashes of the 1855 Ansei earthquake in which approximately 10,000 people died. Of particular interest is the influence Hiroshige’s prints had on European art in the late 19th century. Both Vincent Van Gogh and James McNeill Whistler found inspiration in Hiroshige’s landscapes. Van Gogh went so far as to copy the prints Plum Park in Kameido and Sudden Shower Over Shin-Ohashi Bridge and Atake, acknowledging Hiroshige in the titles of the paintings. Left, Hiroshige: Plum Estate, Kameido 1857; from "One Hundred Famous Views of Edo"; 13.25 × 8.625 in (33.7 × 21.9 cm); The Brooklyn Museum. 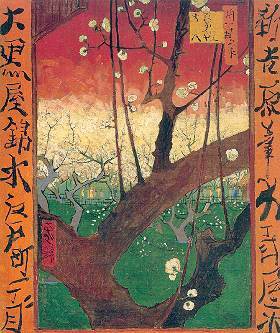 Right, van Gogh: Japonaiserie, 'Flowering Plum Tree' (after Hiroshige), Oil on canvas, 55 × 46 cm (21.7 × 18.1 in); Van Gogh Museum, Amsterdam.